How do you like your marmalade? Finely cut, sweet and golden? Or thick-cut, bitter-sweet and treacly? My preference is definitely for the latter and the darker the better. I’m not sure when my love of marmalade started or where it came from. I can’t ever recall my mum or grandmothers making it, but mum does love eating it. I remember giving her all my chunks of peel when I was younger for her to pile onto her toast. Perhaps that’s where it started. 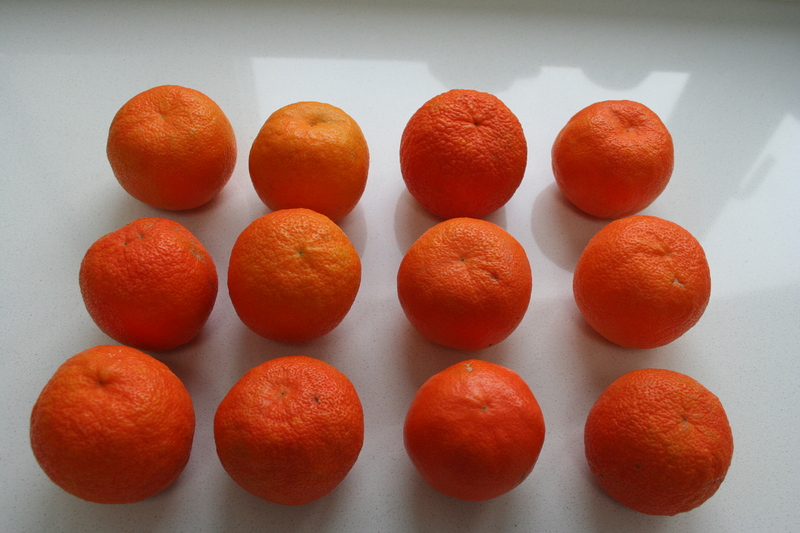 This time of year is when you can find Seville oranges in the shops in the UK. It’s a short season (January to February), so if you fancy having a go at making marmalade buy them now while you can. These bitter oranges are definitely not for eating – they are far too sour and full of pips – but they do make THE best marmalade. I’ve just finished potting up my favourite kind. Standing in my kitchen, scraping the bottom of the preserving pan with a toasted bagel to get at every last drop of gorgeousness, I had a moment – you know, when everything in your world feels alright – and I felt a burst of ridiculous happiness. 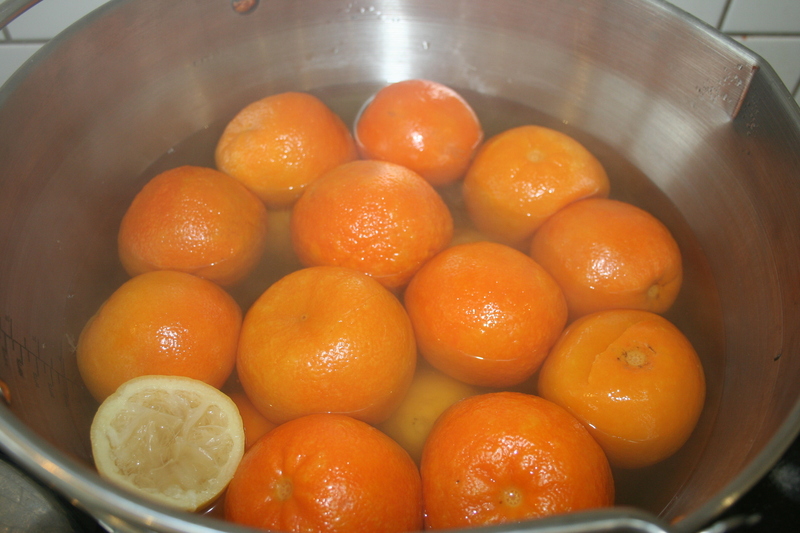 There are many different marmalade recipes and methods but here’s how I make it. Wash the oranges and lemons. Halve the lemons, squeeze the juice from them and set it aside for later. Put all the fruit in a large saucepan or preserving pan. Add about 3.5 litres of water and bring to the boil. Lower the heat to simmering point, cover the pan and simmer for about 2 hours. At this point, you can go and catch up on blog reading or gardening or something more interesting than watching the pot. 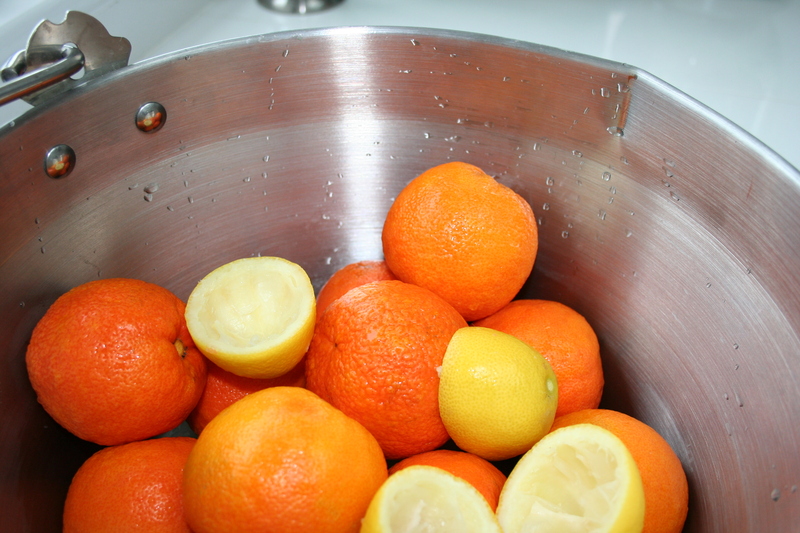 It’s a good idea to check the oranges are cooking evenly and turn them over in the simmering water occasionally. You want the oranges to be very soft – once the sugar is added the rind won’t soften further, so you need to make sure it’s softened sufficiently at this stage. Try squishing one with a wooden spoon. If it gives way easily, they’re done. Leave to cool. You can leave them until the next day if that’s easier. This is the messy bit. Clear a big space and make sure you have a colander, sieve, a couple of bowls and measuring jugs to hand. Lift the fruit out of the pan with a slotted spoon and into a large colander set over a bowl. Take each orange and pull apart, carefully scooping the pips and pith with your hands into a sieve set over a bowl (liquid from this will be rich in pectin, which you want). 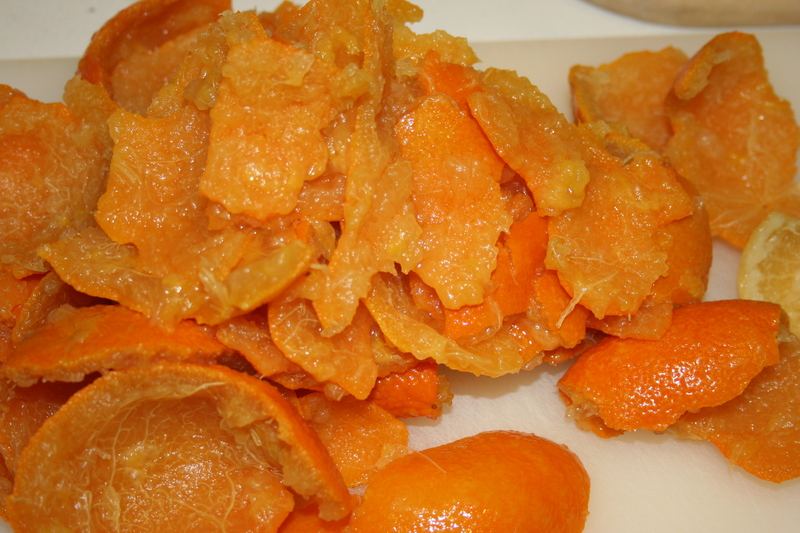 Cut the orange skins into the size of shreds you want. I like mine chunky (and it’s less fiddly than cutting very finely). You can also shred the lemons, if you like. 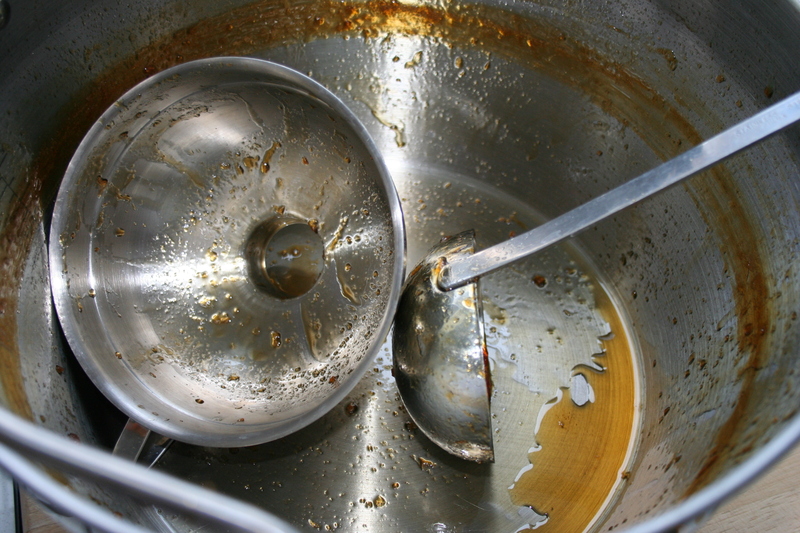 Add any liquid from the colander to the pan. Squish the pith and pips into the sieve and add that liquid too. Measure the overall amount of liquid you have – you’re after about 2.2 litres. Add water to top up if necessary. Add the reserved lemon juice to the liquid in the pan, tip in all the shredded peel and the sugar. 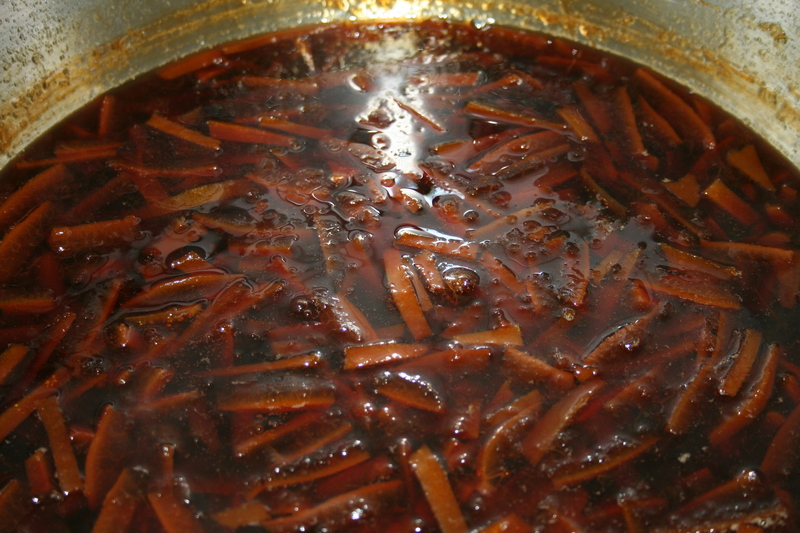 Stir the ingredients together with a wooden spoon over a low heat until the sugar has dissolved, then turn up the heat to bring the marmalade to a rolling boil. Boil rapidly for about 35 minutes and then test for a set: spoon a little onto a chilled saucer, pop it in the freezer for a minute then push the marmalade with your finger. If it wrinkles, you have reached setting point. If it doesn’t, keep boiling and test again every few minutes. 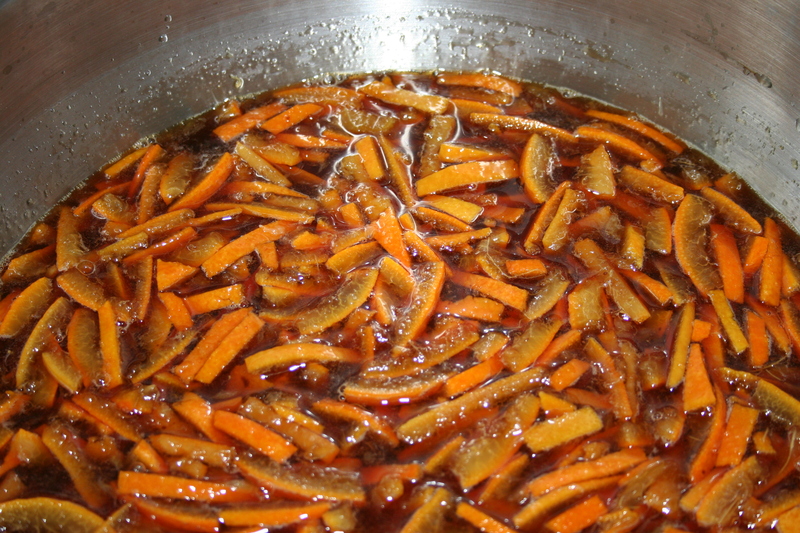 Once your marmalade is ready to pot, remove the sterilised jars from the oven and put alongside the pan. Place the jam funnel in the top of each jar and use the ladle to fill to about 1cm from the top. Fill each jar in turn then place a lid or waxed disc on top of each one. If you have a little left over (more than for a toasted bagel), scrape it into a bowl and cover with clingfilm. Use this up before you start on the jars. Leave the jars to cool, then tighten the lids (or cover with cellophane tops) before labelling and storing. Unopened jars will apparently keep for about 2 years but mine don’t last long enough to check that claim. I’ve just finished filling my jars, and the whole process is such a satisfying (albeit slow) one! It does take a while, doesn’t it?! But, yes, hugely satisfying. We make and like our marmalade pretty much the same way, and they are always potted in Bonne Maman jars. They look great. My husband is a huge fan of marmalade. Lovely! Just cooked my oranges this afternoon so ready for the shredding. It looks delicious, no wonder you experienced moments of intense happiness. I love those little moments of joy. Thanks Jane 🙂 I didn’t like the peel as a child either, but now I love it. The smell is divine. The kitchen has had a warm, marmalade-y smell for a couple of days. Great post Sam, we all love marmalade here. But, at the risk of sounding heretical, I recently discovered Mamade tins of Seville orange pulp. I never make enough to last the whole year so with half an hour to spare on a summer’s day I refill my jars with Mamade marmalade and it is very good. All the fun of potting up but none of the mess. I recently read that Seville oranges traditionally arrive in the UK in January when the housewife has time to make marmalade after the Christmas rush. I thought about this and realised that Seville oranges are probably at their best in October and possibly what gets imported in January represents the very end of the season, a sort of last chance to make marmalade. This has been going on for centuries. There is a letter by Jane Austen written in January for a receipt (sic) for Orange wine. She is very keen to get hold of it quickly because she realises that the window for making will be over soon. Just imagine crates of Seville oranges being unloaded at the major ports in the 18th century, the colour and smell on a grey winter’s day. 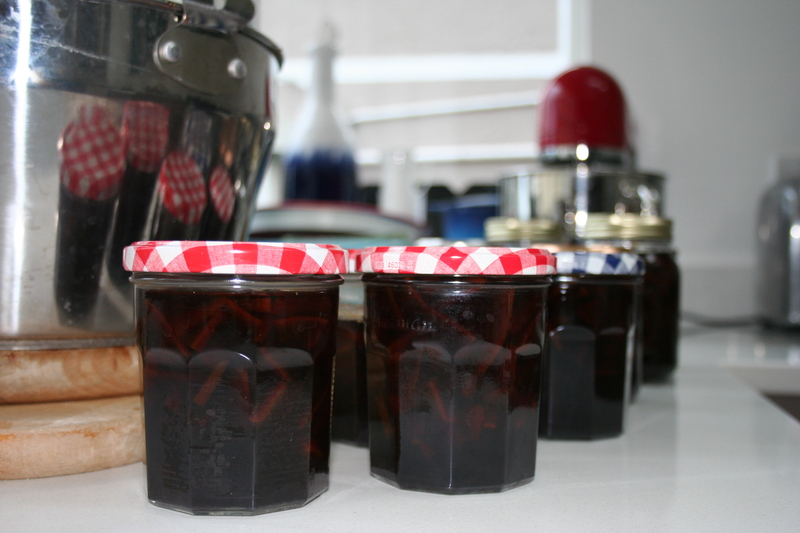 You just can’t beat a January marmalade making session with the real thing and your photos have my taste buds tingling. Thank you for such a fascinating comment Sarah. I love the thought of Jane Austen waiting for her Sevilles to arrive to make orange wine (mmm wonder what that’s like…) and crates of the sunny Spanish fruit landing at the ports. These days they’re probably flown in. I did a little research on Sevilles and I think the season really is Dec–Feb in Spain so we’re not necessarily being sent the rejects 🙂 Marmalade-making is something I look forward to each January but I will look out for the Mamade pulp – interesting! Your marmalade looks fab Sam. Seville oranges always seem such a vibrant pop of colour in the middle of January. I need to make mine quickly as we’re on the last jar from last year. I find a tablespoon of Marmalade Gin added to the bottom of each jar before filling adds a little something. I have a recipe for adding a couple of tablespoons of whisky or brandy to the marmalade (which I haven’t been tempted to try) but the gin sounds delicious. Just the kick you might need on a dark winter morning. There is one missing ingredient for my favourite marmalade, whisky, especially in winter time! For me, marmalade always looks more delicious than it tastes. But maybe I just need to sample more kinds of marmalade. You do. I’d send you a jar but I fear it may not make it all the way to you intact. yum. I made marmalade for the first time last year, I loved how the house smelt so “orangey”! and of course I get to pretend to be Paddington with my marmalade sandwiches! Do you keep them in your hat?! I do love Paddington.